Patrick is regularly in demand as a performer on all his instruments as a sideman and leader and works in a varied range of styles. Commercial artists Patrick has worked alongside in a performing capacity include Sir Tom Jones, JP Cooper, Heather Small, The O’Jays, Peter Andre, Ronan Keating, Jack Jones, Hamish Stuart, Michael Ball, Alfie Boe, Michael Bublé, The Lighthouse Family, Omar Kamal, Guy Garvey, Matthew E White, James Taylor Quartet, Si Cranstoun and Howie Casey. 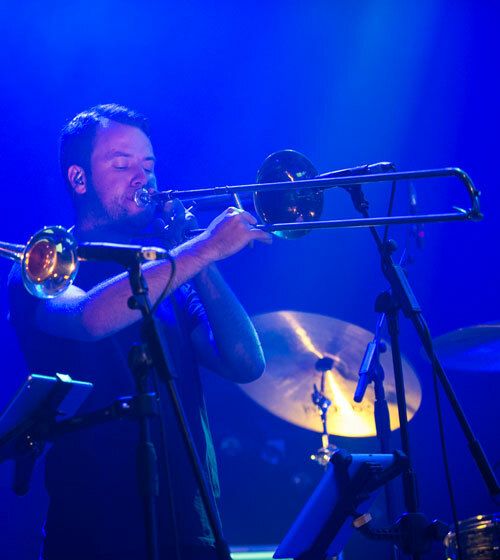 Patrick is also the trombonist and horn arranger for the new band ‘360’. This band compromises of three of the original members of the legendary funk band ‘Average White Band’; Hamish Stuart, Molly Duncan and Steve Ferrone. Patrick appears regularly within the jazz, orchestral and world music scenes and has performed with diverse musicians and groups such as Snarky Puppy, Curtis Stigers, Gregory Porter, Jim Mullen, Shelly Berg, Dave Douglas, Nestor Torres, The Henry Mancini Institute Orchestra (Miami), Bournemouth Symphony Orchestra, The Lebanese Philharmonic Orchestra, NYJO and is a member of both the London Jazz Orchestra and London City Big Band. Patrick has appeared on television many times performing on such shows as ‘The X Factor’, ‘The Voice’ UK, ‘Strictly Come Dancing”, ‘The Alan Titchmarsh Show’ and ‘In A League Of Their Own’ to name a few. He has also performed at many major festivals around the world such as the Montreux Jazz Festival, Proms in the Park (Hyde Park,) London Jazz Festival and Festival Miami. Patrick has also played in the orchestra pits of London’s West End in the European premieres of ‘Elf The Musical’, ‘Motown – The Musical’ and ‘Tina’ – the Tina Turner musical.